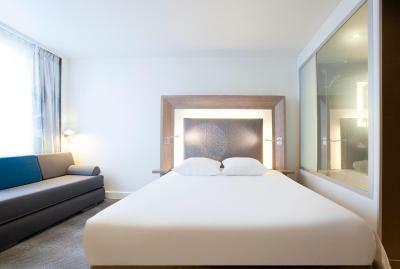 Lock in a great price for Novotel Paris Gare De Lyon – rated 8.4 by recent guests! We stayed here with our two children ages 2 and 4. They enjoyed the pool and the play area as well as the play area in the courtyard. Jet lag woke them up at 3:00 am the first night so we checked out the trains at Gare de Lyon and had some breakfast as soon as the cafes opened. The room was clean and the staff very friendly. It is located close to the trains and Metro. Overall, the hotel is good and the access is good. It was clean, silent, modern, everything was there. Actually it was ok, but you missed the passion in every detail of the hotel. Great location and aesy access to public transportation. I like that it was close to restaurants and the train station. The breakfast was really good and kids loved it. The front line staff needed work. The gentleman that checked us out was lovely. Checking in was horrible since it was late and I think the staff was tired and the lobby was very dirty. Perfect location to catch a train from Gare de Lyon. Great location, 24 hour swimming pool, friendly helpful staff. 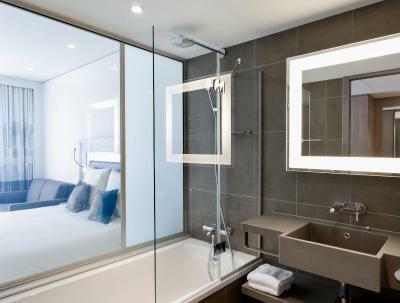 One of our top picks in Paris.Located opposite Gare de Lyon Train and Metro Station in the heart of Paris, Novotel Paris Gare De Lyon offers a fitness center and a 24-hour heated indoor swimming pool. The air-conditioned rooms are equipped with free WiFi internet, a 42-inch flat-screen TV and desk. 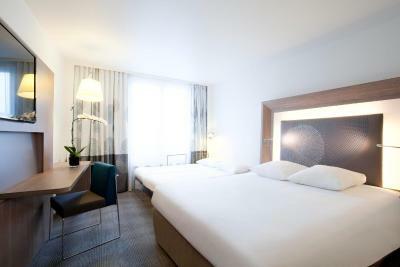 Novotel Paris Gare De Lyon provides a 24-hour à la carte service and guests can enjoy breakfast in their rooms. A variety of restaurants can be reached within walking distance. 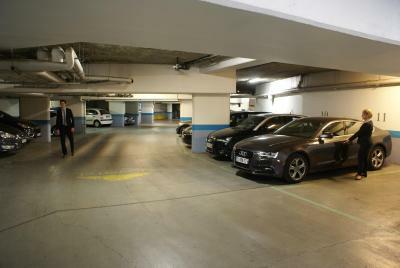 The hotel reception is open 24 hours a day and guests have access to a luggage storage facility and a private car park. On weekends and during school holidays children's entertainment is provided. 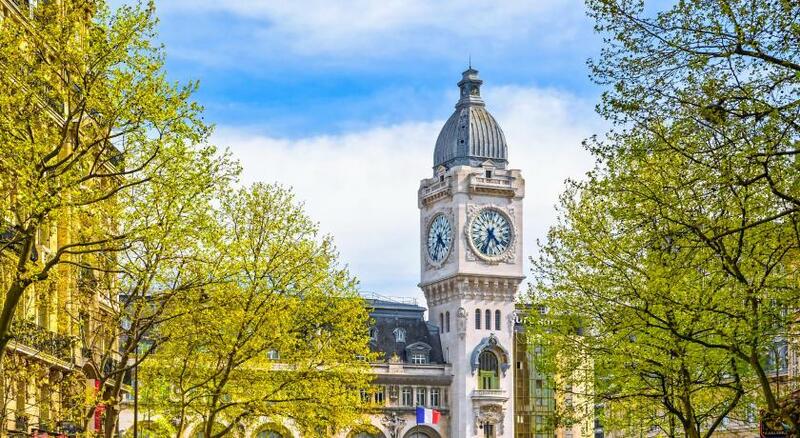 The Louver Museum is 14 minutes away by metro from Novotel Paris Gare De Lyon and the Orsay Museum is 25 minutes by RER C. The nearest airport is Orly Airport, 9.9 mi away. 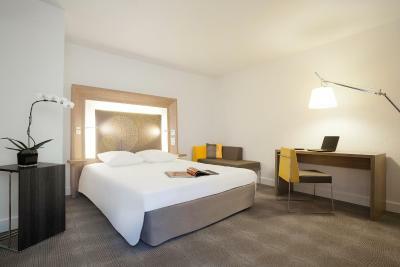 When would you like to stay at Novotel Paris Gare De Lyon? This modern renovated room has free Wi-Fi, a 42-inch flat-screen TV, a free minibar, a Nespresso machine, slippers and bathrobes. The private bathroom has a rain shower and an iPod docking station is also provided. This room can accommodate up to 2 adults. This modern renovated room is equipped with free Wi-Fi, a 107-cm flat-screen TV, a free mini-bar, a Nespresso machine, slippers and bathrobes. The private bathroom has a rain shower. An iPod docking station is also provided. This room can accommodate up to 2 adults and 1 child of 15 years old or less. 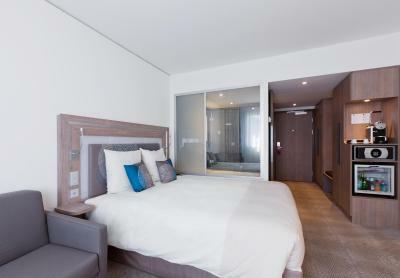 This modern-style room is equipped with free Wi-Fi, a 107-cm flat-screen TV, tea / coffee facilities and a private bathroom. An iPod docking station is also provided. This renovated room has free Wi-Fi, a 42-inch flat-screen TV, tea and coffee-making facilities, and a private bathroom. An iPod docking station is also provided. This room can accommodate up to 3 adults. This modern renovated room is equipped with free Wi-Fi, a 107-cm flat-screen TV, a free mini-bar, a Nespresso machine, slippers and bathrobes. The private bathroom has a bathtub. An iPod docking station is also provided. This room can accommodate up to 2 adults and 2 children of 15 years old or less. Please note that an extra bed or children's cot cannot be accommodated in this room. This modern renovated room is equipped with free Wi-Fi, a 107-cm flat-screen TV, tea / coffee facilities and a private bathroom with rain shower. An iPod docking station is also provided. This modern renovated room is equipped with free Wi-Fi, a 107-cm flat-screen TV, a Nespresso coffee machine and a private bathroom. 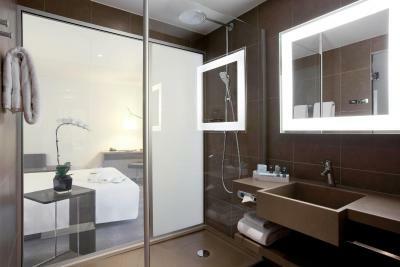 An iPod docking station is also provided.The bathroom is fitted with a rain shower and includes slippers and bathrobes. This modern renovated room is equipped with free Wi-Fi, a 107-cm flat-screen TV, tea / coffee facilities and a private bathroom with bathtub. An Ipod docking station is also provided. 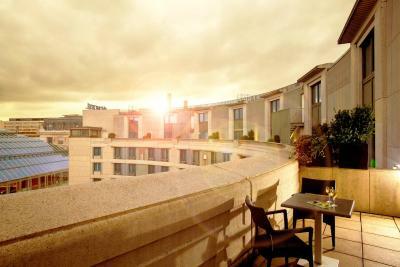 House Rules Novotel Paris Gare De Lyon takes special requests – add in the next step! Novotel Paris Gare De Lyon accepts these cards and reserves the right to temporarily hold an amount prior to arrival. The heated, indoor pool is open 24 hours a day, 7 days a week. The fitness center opens every day from 06:00 to 22:00. Please note that early check-in before 14:00 is subject to room availability and cannot always be guaranteed. Bathroom had see through screen, which could be misted, but didn’t really work for family room. Also being near station quite a few homeless in the area and on an evening it didn’t feel safe. 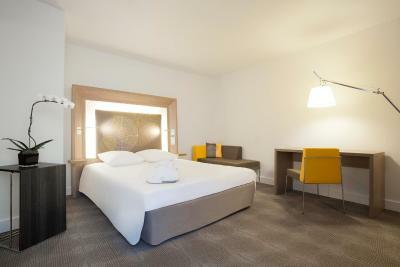 Facilities bar, pool, gym plus location near to station for convenience of getting around Paris. There wasn't really any room to get changed for the pool downstairs but that was easy solved getting changed in our room. The beds were on the firm side but they were comfortable. A great hotel for a family. Staff were friendly and helpful, the location was good for using the Metro. Our children loved cooling off on the pool and unlike some hotels, we weren't restricted on the time children could use the pool. The rooms were an ideal size for a family of 4 and I liked their environment effort. There was enough in the hotel to keep the children happy including a table football. The breakfast had a great selection and was good value as children were free. We ate our locally two evenings and there was choice and quality in the nearby restaurants. Overall, we were very pleased with our choice of hotel. They have same breakfast spread every morning. They should really work on breakfast menu. A little change everyday would be loved by everyone. They should provide basic toiletries in bath. pool quite dirty, room rather dirty too. smelly and most likely never washed curtains. breakfast, location and facilities for kids were great! On this occasion, the quality of our evening meal was not very good. Breakfast was crowded and noisy because it was Easter school holidays. 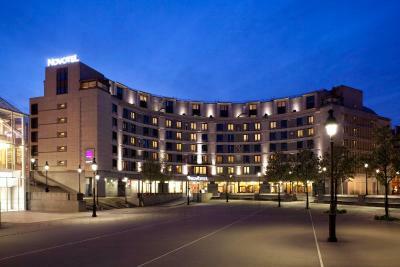 We have stayed at this hotel many times as it is very convenient for Gare de Lyon. It is very clean and comfortable. I could hear loud voices at night. An electric kettle in the room would be a good addition. The mattress on the bed was nice and firm. Great for anyone with a back problem. Breakfast was good. Everything was great. We do not have any complaints. In shocking contrast to the Novotels we stayed at in the UK and Poland we found Novotel Gare De Lyon extremely disappointing. In a superior double room we found foam coffee cups, plastic glasses, wodden stirring sticks. Basic toiletries - only a small soap bar and shower gel dispenser. No dedicated shampoo, conditioner, shower cup, robe. Toilet/ bathroom leaves almost no privacy even with the dim window between the bathroom and the room. Breakfast room was very busy, you need to wait in the line. Breakfast itself is poor and limited-for the whole duration of our stay there were no vegetables at all, not even a tomato slice. Fruit not good, smelled of refrigerator. Supermarket quality meat and (surprisingly for France!) poor choice of cheese. Pool is not child friendly at all with 3 lockers total (!) and no facilities for kids (no toys/swimming foam). The location is covenient for the metro & train. Breakfast seemed a bit disorganised at times with things not being replenished as they ran out. We ate breakfast on the 1st floor family area on the 3rd day which seemed calmer although our 8yo was disappointed that they didn’t have the pancake maker in that breakfast room. The room was lovely and the beds were comfortable. Our 8 year old loved the XBox and games table in the kids area. Check in/out was efficient.